is called a power series in (x − a). If in (1) or (2) x is replaced by a specific real number, then the power series becomes a series of constants that either converges or diverges. Note that series (1) converges if x = 0 and series (2) converges if x = a. If power series (1) converges when |x| < r and diverges when |x| > r, then r is called the radius of convergence. Similarly, r is the radius of convergence of power series (2) if (2) converges when |x − a| < r and diverges when |x − a| > r.
The set of all values of x for which a power series converges is called its interval of convergence. To find the interval of convergence, first determine the radius of convergence by applying the Ratio Test to the series of absolute values. Then check each endpoint to determine whether the series converges or diverges there. Thus, the radius of convergence is 1. The endpoints must be tested separately since the Ratio Test fails when the limit equals 1. When x = 1, (3) becomes 1 + 1 + 1 + · · · and diverges; when x = −1, (3) becomes 1−1 + 1−1 + ··· and diverges. Thus the interval of convergence is −1 < x < 1. For what x does converge? The radius of convergence is 1. When x = 1, we have an alternating convergent series; when x = −1, the series is which diverges. Thus, the series converges if − 1 < x 1. For what values of x does converge? which is always less than 1. Thus the series converges for all x.
which is less than 1 if |x − 2| < 2, that is, if 0 < x < 4. Series (4) converges on this interval and diverges if |x − 2| > 2, that is, if x < 0 or x > 4. When x = 0, (4) is 1 − 1 + 1 − 1 + · · · and diverges. When x = 4, (4) is 1 + 1 + 1 + · · · and diverges. Thus, the interval of convergence is 0 < x < 4. Find all x for which the series converges. C2. 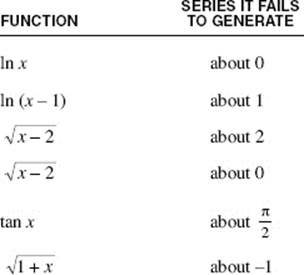 Functions Defined by Power Series. its domain is the interval of convergence of the series. PROPERTY 2a. The function defined by (1) is continuous for each x in the interval of convergence of the series. Note that power series (1) and its derived series (2) have the same radius of convergence but not necessarily the same interval of convergence. Find the intervals of convergence of the power series for f (x) and f ′(x). Hence, the power series for f converges if −1 x 1. 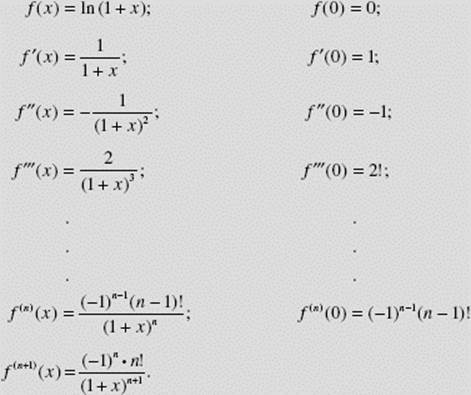 Hence, the power series for f ′ converges if −1 x < 1. Thus, the series given for f (x) and f ′(x) have the same radius of convergence, but their intervals of convergence differ. Let Show that the power series for converges for all values of x in the interval of convergence of the power series for f (x). 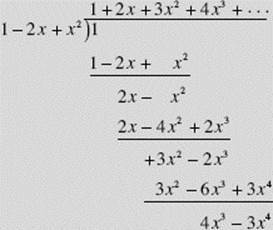 SOLUTION: Obtain a series for by long division. It can be shown that the interval of convergence is −1 < x < 1. C3. Finding a Power Series for a Function: Taylor and Maclaurin Series. is called the Taylor series of the function f about the number a. There is never more than one power series in (x − a) for f (x). It is required that the function and all its derivatives exist at x = a if the function f (x) is to generate a Taylor series expansion. 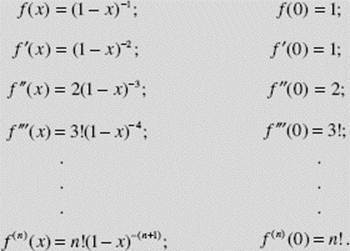 called the Maclaurin series of the function f; this is the expansion of f about x = 0. 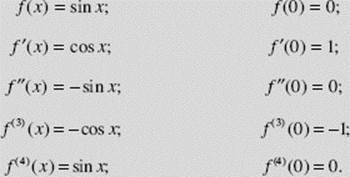 Find the Maclaurin series for f (x) = ex. Find the Maclaurin expansion for f (x) = sin x. Note that this agrees exactly with the power series in x obtained by different methods in Example 39. 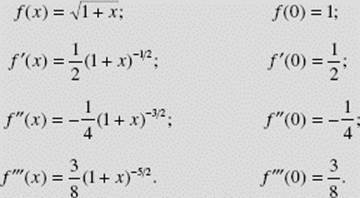 Find the Taylor series for the function f (x) = ln x about x = 1. FUNCTIONS THAT GENERATE NO SERIES. C4. Approximating Functions with Taylor and Maclaurin Polynomials. 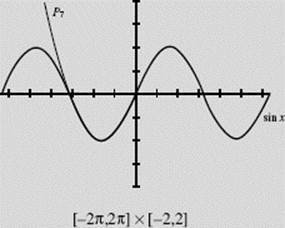 The Taylor polynomial Pn (x) and its first n derivatives all agree at a with f and its first n derivatives. 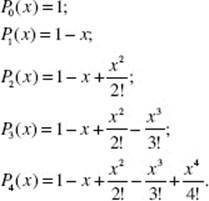 The order of a Taylor polynomial is the order of the highest derivative, which is also the polynomial’s last term. f (x) P1 (x) = f (0) + f ′(0)x. It is the “best” linear approximation to f at 0, discussed at length in Chapter 4 §L. A Taylor polynomial has degree n if it has powers of (x − a) up through the nth. If f (n) (a) = 0, then the degree of Pn (x) is less than n. Note, for instance, in Example 45, that the second-order polynomial P2 (x) for the function sin x (which is identical with P1 (x)) is or just x, which has degree 1, not 2. Find the Taylor polynomial of order 4 at 0 for f (x) = e−x. Use this to approximate f (0.25). This approximation of e−0.25 is correct to four places. 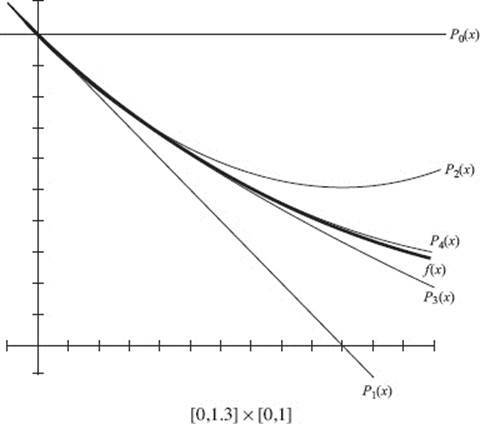 Notice how closely P4 (x) hugs f (x) even as x approaches 1. Since the series can be shown to converge for x > 0 by the Alternating Series Test, the error in P4 (x) is less than the magnitude of the first omitted term, at x = 1. In fact, P4 (1) = 0.375 to three decimal places, close to e−1 ≈ 0.368. (a) Find the Taylor polynomials P1, P3, P5, and P7 at x = 0 for f (x) = sin x. 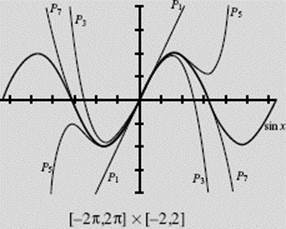 (b) Graph f and all four polynomials in [−2π,2π] × [−2,2]. (c) Approximate sin using each of the four polynomials. (b) Figure N10–3a shows the graphs of sin x and the four polynomials. 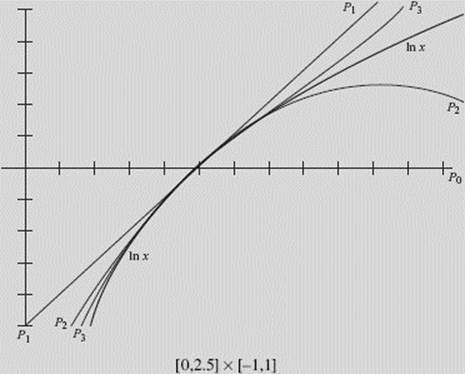 In Figure N10–3b we see graphs only of sin x and P7 (x), to exhibit how closely P7 “follows” the sine curve. We see that P7 is correct to four decimal places. (a) Find the Taylor polynomials of degrees 0, 1, 2, and 3 generated by f (x) = ln x at x = 1. (b) Graph f and the four polynomials on the same set of axes. (c) Using P2, approximate ln 1.3, and find a bound on the error. (b) Figure N10–4 shows the graphs of ln x and the four Taylor polynomials above, in [0,2.5] × [−1,1]. (c) ln 1.3 ≈ P2 (1.3) = (1.3 − 1) − − 0.045 = 0.255.
correct to three decimal places? For x > 0, this is an alternating series with terms decreasing in magnitude and approaching 0, so the error committed by using the first two terms is less than If then the given approximation formula will yield accuracy to three decimal places. We therefore require that |x|3 < 0.0015 or that |x| < 0.114. C5. Taylor’s Formula with Remainder; Lagrange Error Bound. When we approximate a function using a Taylor polynomial, it is important to know how large the remainder (error) may be. If at the desired value of x the Taylor series is alternating, this issue is easily resolved: the first omitted term serves as an upper bound on the error. However, when the approximation involves a nonnegative Taylor series, placing an upper bound on the error is more difficult. This issue is resolved by the Lagrange remainder. and c is some number between a and x. Rn (x) is called the Lagrange remainder. Note that the equation above expresses f (x) as the sum of the Taylor polynomial Pn (x) and the error that results when that polynomial is used as an approximation for f (x). 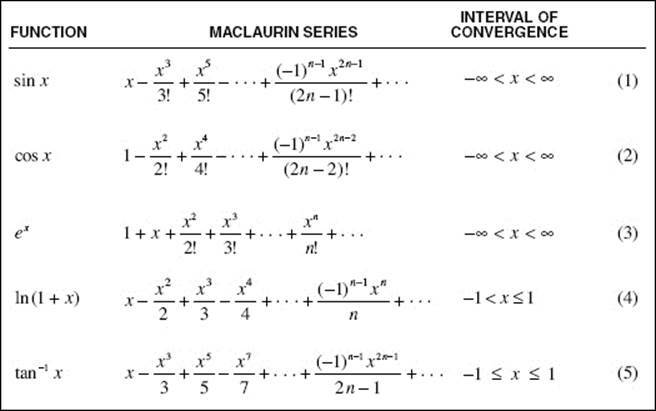 Estimate the error in using the Maclaurin series generated by ex to approximate the value of e.
Find the Maclaurin series for ln (1 + x) and the associated Lagrange error bound. 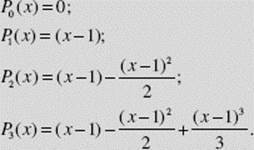 NOTE: For 0 < x < 1 the Maclaurin series is alternating, and the error bound simplifies to the first omitted term. The more difficult Lagrange error bound applies for −1 < x <0. Find the third-degree Maclaurin polynomial for and determine the upper bound on the error in estimating f (0.1). 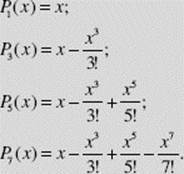 SOLUTION: We first make a table of the derivatives, evaluated at x = 0 and giving us the coefficients. where x = 0.1 and 0 < c < 0.1. C6. Computations with Power Series. 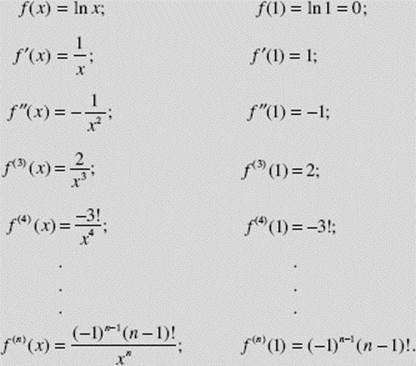 The power series expansions of functions may be treated as any other functions for values of x that lie within their intervals of convergence. They may be added, subtracted, multiplied, divided (with division by zero to be avoided), differentiated, or integrated. These properties provide a valuable approach for many otherwise difficult computations. Indeed, power series are often very useful for approximating values of functions, evaluating indeterminate forms of limits, and estimating definite integrals. Compute to four decimal places. so correct to four decimal places. is used and |x| < 0.02.
a well-established result obtained previously. Show how a series may be used to evaluate π. Use a series to evaluate to four decimal places. †C7. Power Series over Complex Numbers. A complex number is one of the form a + bi, where a and b are real and i2 = −1. If we allow complex numbers as replacements for x in power series, we obtain some interesting results. sometimes referred to as Euler’s magic formula. † This is an optional topic not in the BC Course Description. We include it here because of the dramatic result. In this chapter, we have reviewed an important BC Calculus topic, infinite series. We have looked at a variety of tests to determine whether a series converges or diverges. 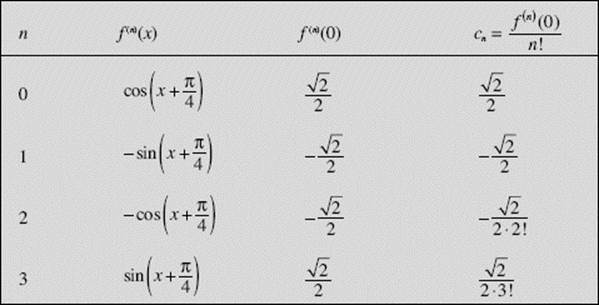 We have worked with functions defined as power series, reviewed how to derive Taylor series, and looked at the Maclaurin series expansions for many commonly used functions. Finally, we have reviewed how to find bounds on the errors that arise when series are used for approximations.